Although the settlers enjoyed self-government from the 1850s, New Zealand remained officially a British colony. In 1907 its status was changed from colony to dominion. Dominion status was proclaimed with a flourish. 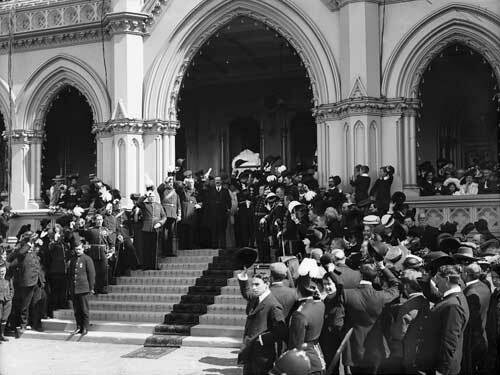 In this photograph the proclamation is being read on the steps of Parliament. But it was a symbolic gesture indicating the young nation’s growing self-confidence rather than a significant change in the way it was governed.